Friends..Here is the useful Current Affairs Multiple Choice Quiz for 13 August 2015. You can attempt this online Quiz and check your score in real time. Questions are useful for all upcoming competitive exams. 1) Who among the following was on 13 August 2015 appointed as the New Election Commissioner? 2) Who among the following was on 12 August 2015 re-elected as Amul Chairman? 3) The 22nd edition of Badminton World Championships 2015 is held from 10 - 16 August 2015 at? 4) Which tech giant has recently given benefits of around $21 million to Indian app developers as part of its initiative? 5) Which country has recently devalued its currency by 1.9 per cent, for the first time since 1994? 6) Acharya Dev Vrat, was on 12 August 2015 sworn in as the 27th Governor of? 7) Union Cabinet on 13 August 2015 approved MoU between India and which neighbouring country for construction of petroleum pipeline? 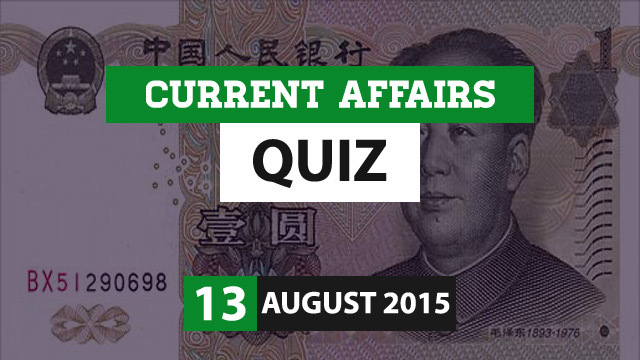 8) Which player on 12 August 2015 won the World 6-Red Snooker Championship 2015? 9) International Youth Day was recently observed on? 10) Which country recently won overall championship in Asian Youth Chess Championship 2015?